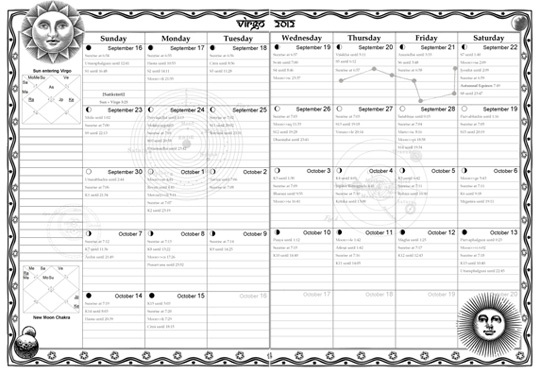 The Vedic Planner is a free monthly calendar that lists the Moon phases (tithi) and constellations (nakshatra) with an ephemeris of all planets for Pacific Standard Time. It uses the sidereal solar months starting with the Sun entering Capricorn on January 14th. This calendar is a mandala of Time that is reshaping our brain to the stellar reality. It is a calendar designed to align us with the solar and lunar motion and awaken us to the frequencies of the stars and planets moving all around us. The vibrations of it attune us to the Universe. The monthly calendar starts with the Sun entering a solar sign. Therefore when you look at the calendar the mind is aware of a cohesive energetic time period. This is the way it was done in the ancient world. Each day lists the Moon phase, the star position of the Moon and any change of signs made by the planets. Here is the link to download the free 2019 Vedic Planner, or to buy a printed copy. The Planner is formatted to be printed double-sided and is most functional with spiral binding that allows it to lay flat. The front and back pages are best printed in color (though the whole document on a color option is even better). To see updates on classes and workshops make sure to like the Science of Light Facebook Page. 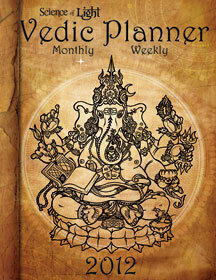 The 2012 Vedic Planner has a longer Introduction by Freedom Cole.